When honoring loss, it is important to celebrate the life of the dearly departed. 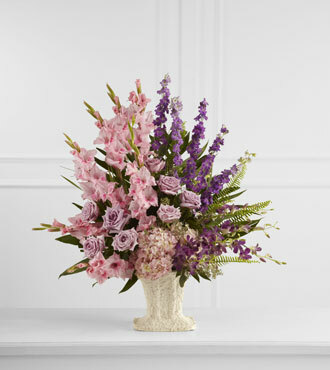 The FTD Flowing Garden Arrangement bursts from the vase, symbolizing the grand beauty in the life of one who was truly special. This rich, overflowing collection of blooms is a perfect tribute to the deceased during a final service. Pink gladiolus, purple dendrobium orchids, purple larkspur, lavender roses, and pink hydrangea arch towards the sky from a bed of bright greens arranged in a unique and beautiful papier mache urn. GREAT bouquet is approx. 34”H x 31”W. GREATER bouquet is approx. 38”H x 33”W. GREATEST bouquet is approx. 42”H x 36”W.